Once again I was glad to escape to the rolling hills of southern Indiana, and the joys of running the Pans ‘N Pancakes country store and restaurant. I have loved this series from the start, but this book was especially great! 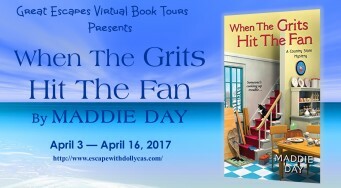 If you’re looking for a well thought out mystery with suspense and characters you can’t help but root for, do yourself a favor and pick up a copy of When the Grits Hit the Fan by Maddie Day. I think it is one you’ll be sure to enjoy. 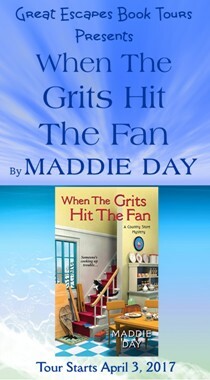 WHEN THE GRITS HIT THE FAN was a mystery full of more twists and turns than a funnel cake. 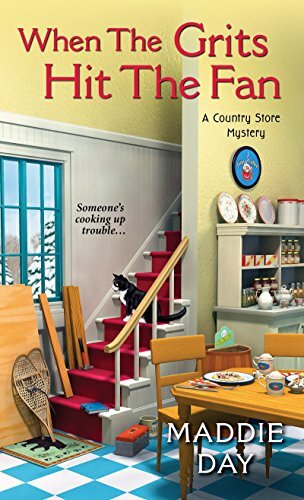 If you are looking for a cozy mystery that is fast paced (never a dull moment) and will keep you on the edge of your seat, I suggest you give When Grits Hits the Fan a try! There a many twists and turns in this book and the writing is superb. This book made me hungry. Hungry for more from Maddie Day, and for the food mentioned in the book. Sign of a good book, is when you want the food mentioned and the series to continue. I love this book and these characters going back and visiting Robbie and her friends, coworkers and customers are great you get to see what everyone is up to. Nothing quite like the tensions of university meetings!